It looks like a down blanket has exploded on our property. The geese are shedding some of their insulating feathers in preparation for the warm season. 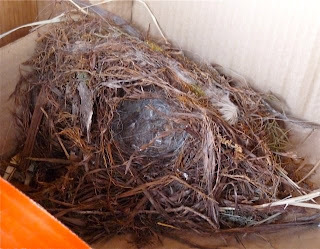 Spoke too soon: I can no longer use the baby birds as an excuse not to clean the side porch. They "flew the coop"! Go birdies, go! and the first organic Peaches of the season. I give thanks that the dentist gave me happy pills for the pain. Oof. Spouse thought Minnie Pearl might have had a dislocated hip. We decided to take her into the vet bright & early this morning. X-Rays showed instead of a dislocated hip, her knee was shattered and ligaments completely rent. Surgery was possible, but success highly unlikely. I decided it would be best to have Pearl euthanized. I held her as the overdose shot of barbiturate was injected. Some might say "well, it's just a chicken", and I'd understand their sentiment. 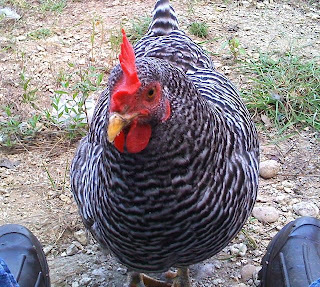 On the other hand, owning chickens has given me a whole new perspective on birds and bird personalities, and to me, chickens are no longer "just chickens". 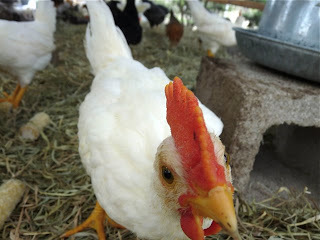 They're amazing, funny, silly creatures who not only entertain, but give us eggs to eat, too. So I'm crying some with Pearl's passing, but I also know this is part of farm life, and will be okay. I'll bury her beneath the big oak tree where our other deceased chickens lay. The cycle of life continues. From the front porch/living room window, Princess asks "whatcha doin'? Whatcha doin'? Whatcha doin'?" I tried so hard not to name her, but a name popped up anyways and stuck: "Minnie Pearl", or "Pearl" for short. 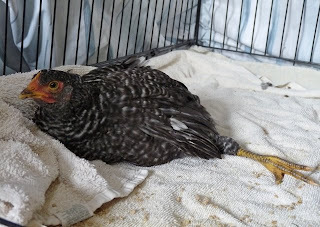 It's not a good idea to name animals if it's uncertain they're going to recover from an injury - it makes emotional detachment much more difficult. Before, I thought I could handle taking her life if she couldn't heal. Now I'm not so sure. She's awake, aware, chirrups, eats and drinks. She doesn't appear to be in any pain. Her left foot still seems nerveless, and now her right foot appears to be lacking control as well. Still, she hobbles around and gets to food & drink just fine. Other than the homeopathic remedies good for healing sprains and ligament/tendon tears & injuries - arnica montana, rhus toxicodendron, ruta graveolens - there's not much more I, or a vet, can do. Time will tell if she heals. Just so you know, Blu-Kote does indeed stain. 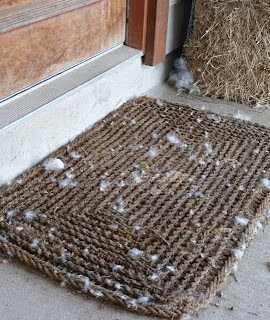 Okay, so here's the long story on what happened: the geese caught one of the pullets and banged her up pretty good, including pulling out some feathers from the top of her head. 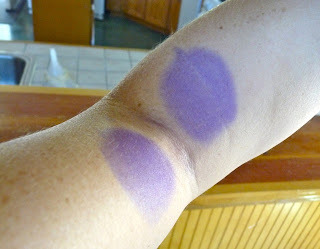 To keep the other chickens from picking at the injury, I sprayed some Blu-Kote so the red wound wouldn't be obvious. Being the overprotective chicken-mama that I am, of course I sprayed some on my arm first. D'oh! What can I say, at least I didn't get any on my shirt. The pullet is resting in a box inside the house, as the other chickens kept pecking at her regardless of the dye job. She might have a pulled tendon, as she can move both thighs, but the power to her left foot is lacking. I'm hoping a day of rest will find her doing better tomorrow. At this time, she's eating, drinking, and softly trilling. CSA Veggie Adventure - A Bust? Oh noes, dental woes! Haven't been eating much of anything these past few weeks, due to dental work. Keeping fingers crossed that the latest adjustment of the porcelain fillings will do the trick. This week's CSA veggie bounty: dandelion greens, beets, carrots, radishes, elephant garlic, and flowers. Time for the Independence Days Challenge check in! I'm finding this weekly check in to be very helpful, as I sometimes think I'm not doing much, but looking back can see that indeed "stuff" is getting done. More about the Independence Days Challenge at Sharon Astyk's blog. Plant something: Missed moon-cycle for planting above-ground produce such as new pasture grass and lettuce. Hope to make the next cycle. Harvest something: Eggs, natch. The geese are starting to slow down their egg production once more, hopefully this is the last of the season. 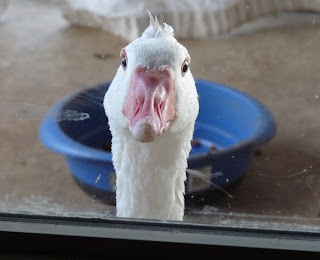 I want my sweet geese back! Preserve something: Sorta - froze bulk garlic and ginger concoction, see Prep & Storage below. 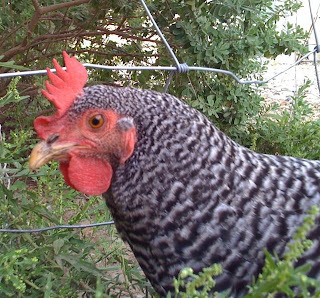 Reduce waste: Continuing to re-use old and/or soiled critter drinking & pool water to water fruit trees, herbs, veggies and poultry pasture. Also using soiled water to keep compost pile “hydrated”. Preparation & Storage: Purchased dried raisins, cherries, sliced almonds, ground flax meal. I use these in home-made oat-based meusli, of which I presoak a serving the day before in soy milk. Spouse got a good deal on fresh ginger and pre-peeled garlic at the asian grocer, and made a garlic/ginger blend, portioned and froze. Ordered 10# of food-grade diatomaceous earth. Eat the Food: Not eating all that much, actually. Dental problems! 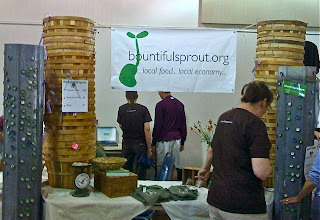 The co-op through which I sell eggs - the Bountiful Sprout - held a vendor/member/advertising "meet and greet" at our local community center today. There was a free showing of the documentary "Food Fight", live music, face-painting, and hands-on crafts for the kids. 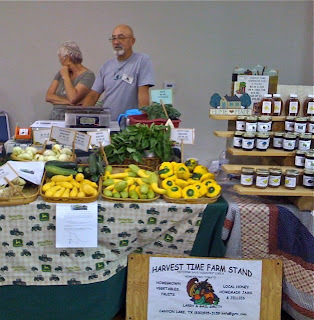 The vendors ranged from bakers to herbalists to ranchers to veggie farmers, and members got to meet and talk to the vendors more in-depth about their products and philosophies. 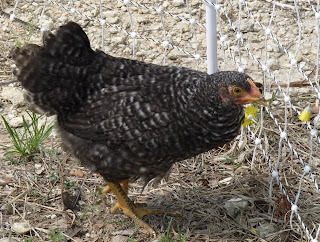 I provided examples of the differences between commercial, caged chicken eggs and pasture-raised chicken eggs. "City" folks and teens were amazed at the difference in yolk color, and most had never seen a goose egg before . 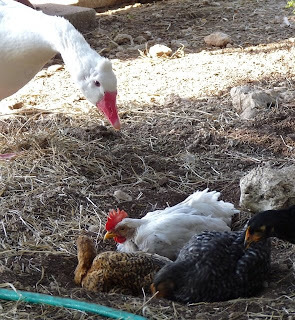 "Old"-timers told funny stories about being raised around chickens and geese. Folks who know me, know that I'm pretty shy and don't talk about myself that much (well, except on this blog), but I feel so passionate about local food systems - and my girls, of course! - that I about talked everyone's ear off. Fell into a discussion with one of the co-op's board members, who is putting together a town-focused social network where folks can skill share and call out for assistance. We talked about how many are craving a sense of community and connection, and that this can be one way of creating a more cohesive community. Especially if the economy continues to tank. I was thrilled to talk more with local producers of pasture-raised pork and beef, and made plans to budget money for shares in the upcoming harvest. Meeting with everyone, making presentations, and seeing people's excitement in what we're doing with the co-op has left me feeling re-energized and re-motivated to push forward on developing our orchard. There's a huge need for a larger variety of local, organic fruits and nuts. Our town also has a small food bank, and it'd be great to have something to give every season. I may even set up a gleaning opportunity if we have enough trees/produce to do so. One thing I forgot to bring - snacks and drinks. I started to have a sugar crash, and ended up eating a coconut/date macaroon from the vendor next to me, and drinking a cup of organic coffee from the vendor across the way. This means Spouse gets to watch me bounce off the walls for the rest of tonight, lucky guy! ("no, not really" I'm sure he'd say) Think I better find a project to pour this energy into while it lasts. Our very first batch of chickens did this. The second batch, not so much because they followed the first batch everywhere. 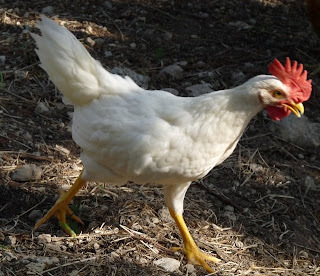 Our third batch of chickens, a herd unto themselves, are taking up the tradition once more. The tradition? "Aiiieeee, we cannot find the opening to the poultry pen!" The poultry pen is pretty darn big, I'll admit. There's approximately 500 feet of netting that gets electrified at night. There's only one way in and out of the pen, a gated opening that's about four feet wide, and is left open for the entire day. The chicks get out. Dizzy with the heady scent of freedom, they get confused as to how to get back in. I'll go out with a stick, and try to "herd" them back into the pen. The chicks will run opposite of where I want them to go. So I run them along the fence-line the opposite way until we get close to the opening. 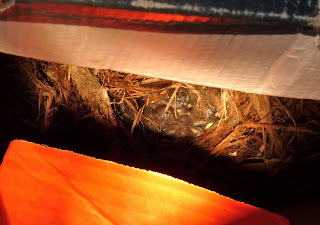 Then the chicks will change their mind and head away from the opening once more, in surety that the opening lay "elsewhere". I run them back around the fence-line again, get close to the opening once more... yeah, you know how this goes by now. 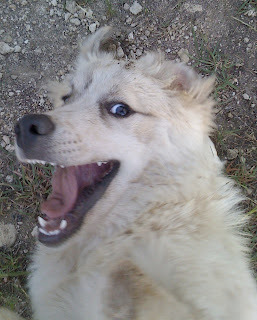 If I'm lucky, Bandit will be nearby and she'll help herd the chickens into the pen. If I'm unlucky, Maggie will think I'm playing and will bounce through the chickens towards me, causing the chickens to scatter. The chickens will figure this all out eventually, just like the first batch did. In the meantime I'm getting sunshine, exercise, and the opportunity to inspect the fence (again and again and again) so it's not all bad, eh? They must have been plotting, that's all I can figure. I thought I had securely closed the opening to the chick run, I really did. Alas, there was one teeny, tiny gap between the closing gate and the run. No sooner had I turned my back to refill their food that a dozen chicks came pouring through that gap like water through a sieve. The remaining six were still eyeballing the opening when I finally turned around and witnessed The Great Escape. It was too darn hot to chase them all. Decided to do what some parents do with their children: "think you're old enough? Go ahead, be my guest! ", and opened the run completely. The geese came by and glared balefully. The dogs came around and tried to eat the chick food. 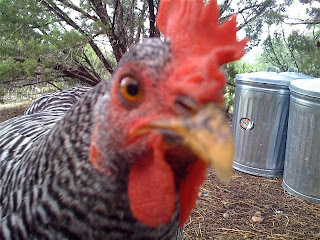 The older chickens then came by and gave the "newbies" a lesson in pecking order. During this brief time, the chicks have learned how to dodge and run VERY quickly. So far no permanent injuries, and hopefully a few cocky Leghorns now understand that they are not Kings of the Land. Frau rules the roost here, and you better not forget it. Plant something: Nope, but am tending some sprouting Flying Dragon orange trees. Harvest something: Gathered goose & chicken eggs (credit for the idea of putting this under "harvest": http://greenbluebrown.blogspot.com). Preserve something: My sanity? Nope... too late. Reduce waste: Hung clothes to dry on clothesline. 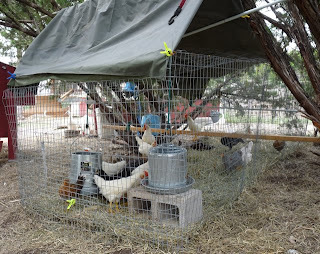 Fixed and re-used old wire chicken run for new pullet shelter. Did not turn on air-conditioner in either car or home. Purchased “antique” metal nest box (10 cubbies) for the chickens at a fraction of the cost of new. Of course, will clean & sanitize thoroughly. Preparation & Storage: purchased in bulk: coffee, dried garlic, curry seasoning blend, dried garbanzo beans, rice flour, garbanzo flour. Bulk homemade pasta sauce frozen. Researching pressure canners, finalizing on an All American 30-quart canner so I can start canning instead of freezing broths and sauces. Last week had electrician come out to look over site for emergency generator. This week, finalizing generator model, plans and costs. Build Community Food Systems: Picked up CSA basket, purchased local goat cheese at our tiny farmers market. Preparing for local co-op vendor/member "meet and greet" next week. Eat the Food: Ate CSA goodies. The flies were getting awful, and the chicks were getting big. Once more, new chick digs were in order. We had an old wire run sitting unused in the back, so I dragged it out to the cedar patch where we keep the laying coop and food. Not only did it provide more height, it also gave two extra feet in depth. Perches, food, water, tarp cover in case of rain... yeah, that was the easy part. The geese provided assistance and monitoring, of course. Next: getting the chicks from pen "A" to pen "B". I'm only one person, so made about oh, say, a dozen or more trips back & forth between the pens, juggling a succession of eighteen wriggling chicks and trying not to lose any. I was unsuccessful in that regard. Yep, chicks got loose. It wasn't just me not keeping a good grip... there was also a couple of small holes in the back that I didn't think would be a problem, and by golly, you know what's next: that's EXACTLY what four of them found, and made their escapes. A total of six chicks out running free ("FREEEEDOOOOM!! "), and I had to catch the little buggers. It took about an hour to catch the majority (fresh corn on the cob is still chicken kryptonite), but there was one little Leghorn who just wasn't taking the bribe. After about a half-hour of cajoling and running him around the cedars, finally set up a boxed-sides trap of blankets and ran him into it. Yoink! Got him! The chicks seem to be settling in and enjoying the new space. The geese are hanging out and watching the new denizens, like it's their private zoo. The older chicken girls aren't too interested yet, although Red (one of the older Americaunas) did give a young, loose Barred a lesson in pecking order when it came to the fresh corn. Think I'm done for the day, and am glad not only for the chicks, but for myself. Now I don't have to listen to the strangled cries of adolescent roosters, trying to find their voices at dawn next to the bedroom window. 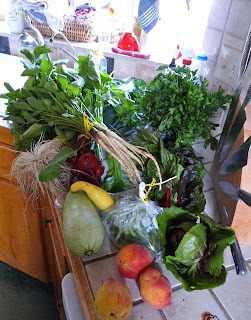 What was in the CSA bag last week: onions, kale, carrots, salad greens, mizuna greens, snow peas, turnips, and a small vase of flowers. What I made: mixed salad greens with mizuna & carrots, wilted mizuna in an omelet, stew with onions, turnips & carrots, and snow peas mixed in with leftover Chinese. Admired the flowers. What's still left to eat (thank goodness for Evert Fresh bags): onions & kale. This week's haul: broccoli, spinach, dandelion greens, salad greens, onions, beets, and another batch of flowers (to admire, not eat). I'm going to force myself to do something with those beets, I mean it this time. The compost pile is still "eating" far too well for my liking. Harvest something: First blackberries of the season, woo-hoo! Preserve something: Purchased meat in bulk, portioned and vacuum-sealed for freezer. Froze extra goose eggs (raw, scrambled). Reduce waste: See Preserve - bulk purchase of meats, vacuum-sealed to protect against freezer burn. Blew out too-old-to-eat goose eggs for a friend’s pysanky crafting. Took cans, bottles, cardboard and paper to recycling center. Build Community Food Systems: Sold eggs through our local co-op. Gave some goose eggs as gift. Agreed to take part in the co-op membership drive event; took flyers for the co-op event to give to neighbors and posted co-op flyer graphic on blog. 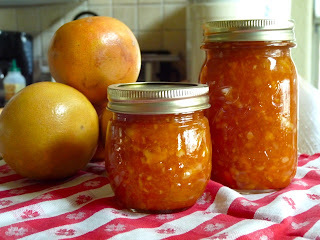 Eat the Food: Ate home-preserved sauerkraut, and ate a friend’s Flying Dragon orange marmalade. Locals: Come Check Out the Co-op! 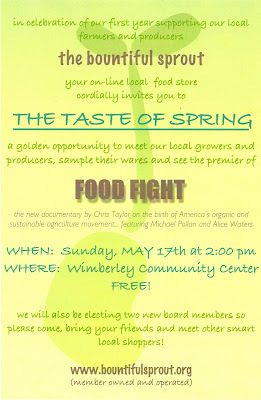 If you live near the Wimberley area, and are interested in eating fresh, locally grown food, come on down to the Community Center on Sunday, May 17th at 2:00 PM. The Bountiful Sprout Co-Op is having a meet & greet for farm vendors, co-op members, and those who might be interested in becoming co-op members! There will also be a premiere (and free!) showing of the documentary "Food Fight". 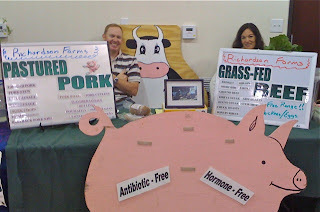 These are the folks through whom I sell our geese and chicken eggs. 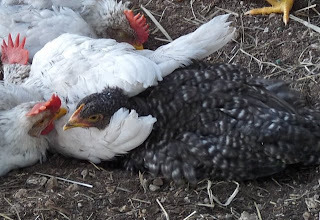 Besides bringing eggs, if a few of the younger chickens are co-operative, I may bring some little fuzzy-butts to my vendor table as well. Hope to see you there!